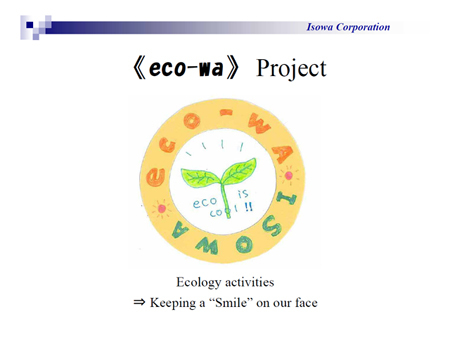 Last year, we started working on activities for the <<eco-wa>> Project, which is based on the concept of "We want to bring smiles to the faces of every single person involved with ISOWA in any way, by working to promote activities that are good for the environment and to extend those efforts to include all the fellow employees and other people around us!!!" The "eco" in "eco-wa" comes from the "eco" in ecology, and the "wa" comes from the "wa" in ISOWA. However, the kanji character for "wa" here also means "circle," and the name for the "eco-wa" project was taken from the meaning of "promoting activities that are good for the environment and extending those efforts to include fellow employees and others around us" = "widening the circle of ecology." We are working toward the pursuit of environment management that will allow us to reduce the wasteful squandering of natural resources and levels of carbon dioxide emissions "in a fun way." What can we do to cut back even more on the amount of energy we use? Is corrugated paper more ecologically friendly than plastic? Is it really ecological to use the back side of copy paper? These are some of the questions we've been asking ourselves.